Dramatically increase production and decrease packaging costs while simplifying the bagging operation for your business. Highly Automated for increased workflow speed, browse our selection of Production baggers by clicking the button below. The T-375 perfectly incorporates the most efficient bagging technology with a thermal transfer printer for “next-bag-out” printing. This patented feature allows for printing, just prior to loading which guarantees accurate labelling. You can now package quantities of just one part number! Adjustable cart available! Weight 50kgs/ 56kgs – 110 lbs./125 lbs. Weight 123kgs / 146kgs – 275 lbs. 325 lbs. The T-1000 Advanced Poly-Bagger™ is our “top-of-the-line bagger”. It is no wonder the T-1000 is also our best-selling machine! Designed for long or short runs, the T-1000 has the capability of cycling over 100 bags per minute, faster than any operator could manually feed. The T-1000 is also fast enough to keep up with automatic infeed equipment including vibratory bowl counters, scales and infeed conveyors. The T-1000 Advanced Poly-Bagger™ is also designed to run inline with punch/stamp presses, injection mold machines, blister machines and other continuous feed manufacturing equipment for inline bagging. 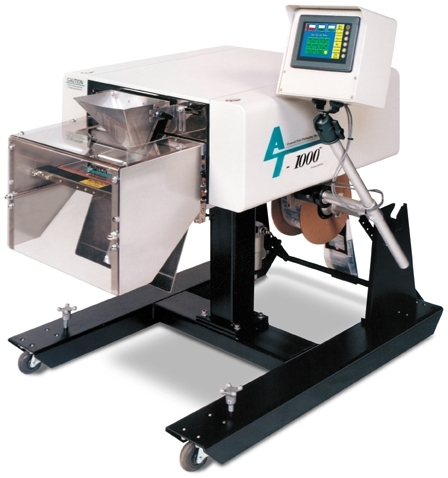 The T-1000 Advanced Poly-Bagger™ can reduce your packaging costs with high speeds, versatility, reliability and simplicity. “User-Friendly” Touch Screen Interface Panel: Change settings “on the fly”, turn on counters or other options, control machine speed, or other auxiliary equipment. Programmable for up to thirty settings. Quickly position the operator panel wherever you desire with a long arm extension and ball joint mounting bracket. Patented “Teflon Shield™” moves Teflon away from heater bar, except when sealing, for extended Teflon life up to 10 times the life of standard sealers. Uses Advanced Poly-Bags™ (pre-opened bags on rolls, manufactured by Advanced Poly-Packaging, Inc.) with sizes ranging from 2″ x 3″ to 14″ x 30″ and thickness from 1 mil to 5 mil. T-1000 “Wide” uses bags ranging from 4″ x 6″ to 18″ x 36″. Four internal counters are standard: 1) Preset Counter – the bagger stops when the predetermined count has been reached. 2) Totalling Counter – reset this counter at the beginning of each shift or day to record packaging production over a period of time. 3) Continuous Strip Counter – set the number of bags (not separated at the perforation) to feed in a continuous strip. 4) Maintenance Counter – total machine cycle counter for preventative maintenance/component inspection intervals. Anti-Jam Device – Detects obstructions in the seal area, automatically reverses the pressure bar and stops the cycle operation. High Speeds: Indexes, opens, seals, and tears off bags at high rates over 100 cycles per minute. Versatility: Bags virtually any product including fasteners, hardware, injection molded parts, kits, crafts, foods, medical devices and more. Runs bags produced from LDPE, LLDPE, HDPE, Foil, Polypropylene, Tyvek™ and various barrier films. 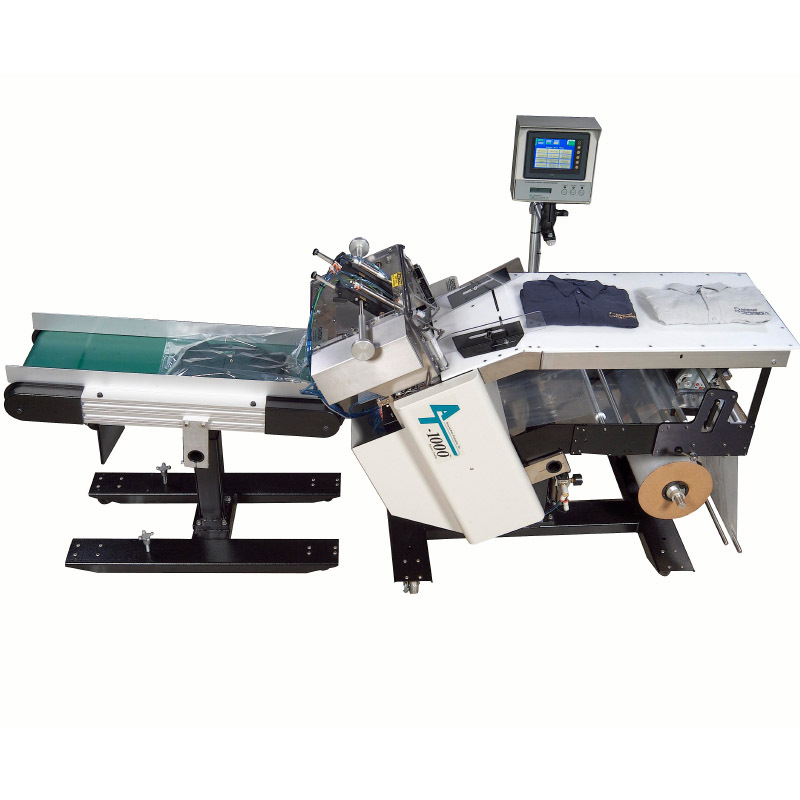 The T-1000 Advanced Poly-Bagger™ is ideal for short runs where product, bag size or print changes are performed in minutes. Reliability: Crafted from the highest quality components and materials, this bagger is built to withstand the most rigorous manufacturing environment. Machined side frames are assembled on a milled table for perfect roller alignment. From its “off-the-shelf” components, cast inner frame and sturdy mounts with casters, we guarantee long life, continual use and minimal maintenance. Simplicity: A “user-friendly” touch screen/pop-up window program allows the operator to setup bag options and auxiliary equipment, save the settings in memory, and recall job settings for repeat runs. Manual operation is as simple as inserting the product and pressing a foot switch. The T-1000 Horizontal Bagger™ perfectly offers versatile solutions to packaging a wide variety of products that are difficult to load on a vertical bagger. It’s perfect for a variety of products including shirts and other clothing, towels and sheets, gasket kits, large gaskets, filters, manuals, kits with instructions, coils of rope or cable, bread or other bagged goods, and more! Manually slide your product horizontally into the bag, or automatically push the product into the bag and your bagger does the rest! After the product enters the bag, the bagger seals the bag at the loading station and automatically discharges the product on an opptional horizontal take away conveyor or a bin. The next bag is then indexed into position and blown open, ready to receive the next product. Adjustable angle – let gravity do most of the work! Standard Touch Screen Operator Panel allows the operator to track production, adjust settings and receive technical operation information. Up to 32 jobs can be saved for instant job changeover. Pop-up numeric keypads and other window and message screens provide fast setting changes and prompt information to operators. A Solid Bronze Heater Bar maintains constant heat with “independent action” sealing. Coupled with our patented Teflon Shield and Anti-Jam obstruction detection, we guarantee perfect seals and low maintenance. A horizontal flat belt conveyor removes product from the sealing area to further packing stations. Increased product pass-through for products up to 8″ thick. 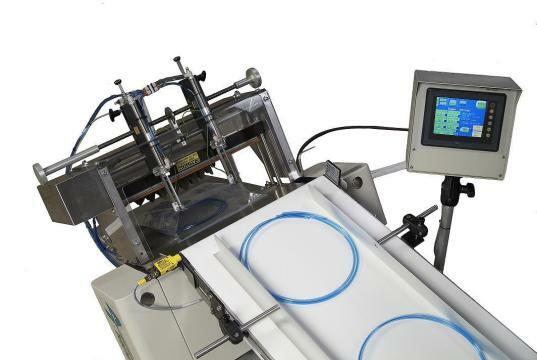 Compact design to “fit” in any packaging operation (shown below with optional Ti-1000 Thermal Transfer Printer). Print inline while loading your product; stop applying pressure sensitive labels. Print part numbers, text, logos, graphics and bar codes directly to the surface of the bag. See the Ti-1000 Thermal Transfer Printer Product page for details. Stainless “Slide” Plate provides a low friction surface with easy-open bag and product guides. Weight 126kgs / 150kgs – 282 lbs. 332 lbs. Belt Speed Up to 50’/min. Up to 50’/min. We should have called it our Ti-1000Z “Speedy Gonzalez” Roll-a-Print. 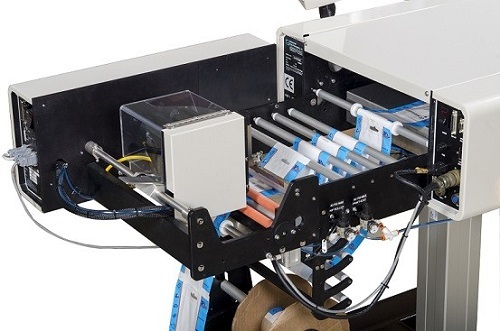 Using Zebra print technology and Advanced Poly feeding and registration technology, the newest and fastest of our Roll-a-Print series can print up to 80 bags per minute. Bags feed continuously through the print head at 10” per second for outstanding print quality. screen that also controls the bagger.